More frame analysis from the uneducated, this time with Day of the Colossus, the second to last episode of the Legend of Korra. 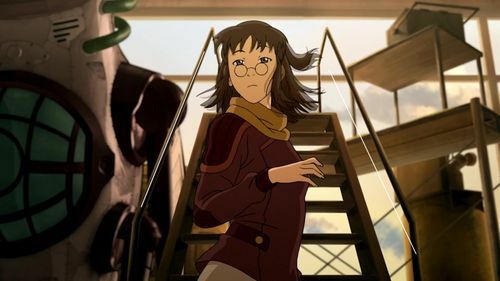 Our first image has Pema trying to get everyone’s attention as the last of the refugees try to flee Republic City at the city’s train station. 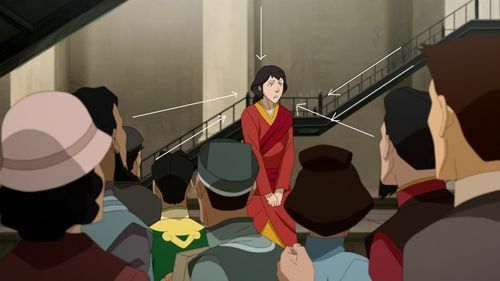 Besides the obvious sight lines from the crowd turning to her, our attention is directed to Pema by the lines of the stairway and the column behind her. Her yellow and red robes set her off from the drag grey background. Meelo has his grand plan to blind the Colossus! 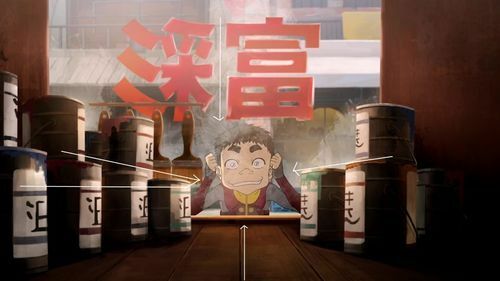 The stacks of paint cans drive our gaze directly to the child air bender with his face pressed against the glass, as do the lines in the plans of wood that form the window’s shelf. This is just one of those frames that are pleasing to the eye. 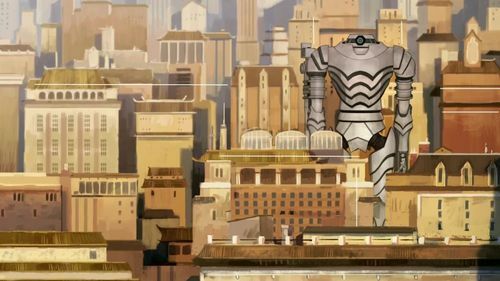 The Colossus stands among the buildings of Republic City, the buildings a collection of tans, browns and reds and the metal behemoth a stark gray. The giant mech stands out by its vertical nature and the wavy lines of its metal plating, in contrast to the number of horizontal lines formed by the building rooftops and facades. Incidentally, the Colossus is also grounded by the two towers, one located on either shoulder, and a third pointed upward to it from below. A simple, but also pleasing frame to the eye. 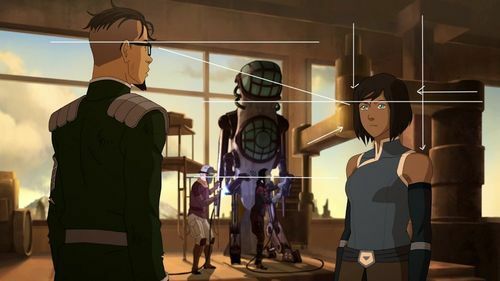 It’s one of several shots in this episode showing the Avatar face to face with her opponent, Kuvira made large in metal and technology. 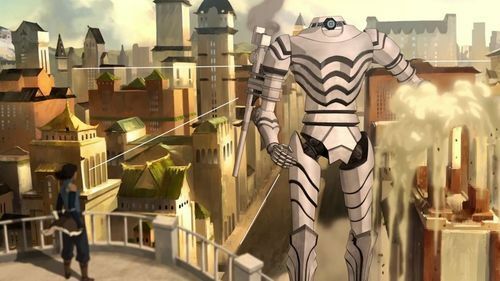 It’s a show of scale with small Korra, microsize on the rooftop, perfectly aligned with the Colossus, itself centered in the frame. To help draw your eyes to the little Korra, a column on the façade of the building she stands on points directly toward her. 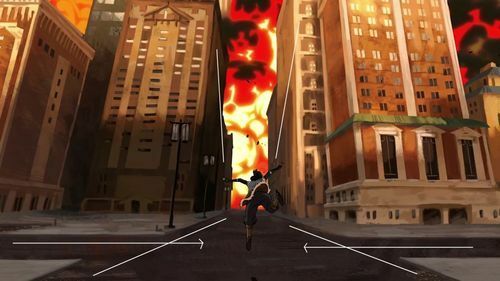 Next is a moment captured by one of the incredible sequences in the action, right after the Colossus spirit cannon lights up a line of buildings behind Korra. 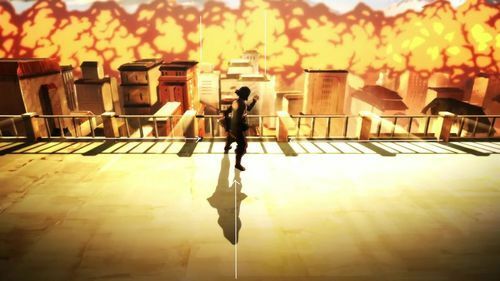 Our Avatar is centered in the frame by both her shadow and the white building placed right before the flames of the explosion. Likewise, the lines of the railing pull your eyes inward to Korra. Bolin supports Opal as the fight goes poorly. With slight echoes to Michelangelo’s Pieta (okay, very slight), our three figures, Bolin, Opal and Lin provide balance to the frame by forming a triangle. Yet, for all that we would think that Bolin and Opal should be the focus of the frame by their placement up front, it’s really their reaction to off screen events to the right, reinforced by Opal’s gaze to Bolin, who gazes to the right, along with Lin. The almost proposal! 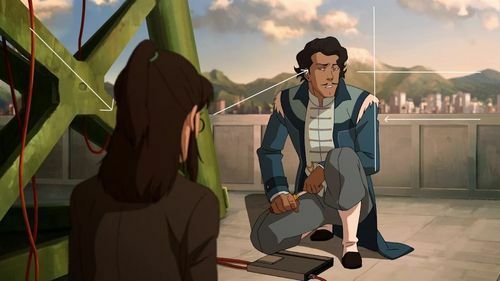 Varrick is relating to Zhu Li about his life back on the farm and not appreciating someone as he tries to rig a massive EMP to take down Kuvira’s mechs and thus, he’s the focus of our attention. But, since Zhu Li is really the subject of his speech, she’s in the foreground, as much in his attention as ours, but out of focus, because, well, she’s not THE center of attention. The lines of the metal pull us down to her, but her gaze points us to Varrick, centered with the mountain peak behind him and level with the horizon and mountain range. Korra is down, but not out. Laid out on the asphalt after an attack on the Colossus, the form of her body serves as the primary means to direct our attention to her determined face. Her body forms two triangles, from her head to her legs, and then her arms and face, which help balance the frame. The smaller, of course, generally centered. Other lines draw your attention to her, the building behind and the line of the road. 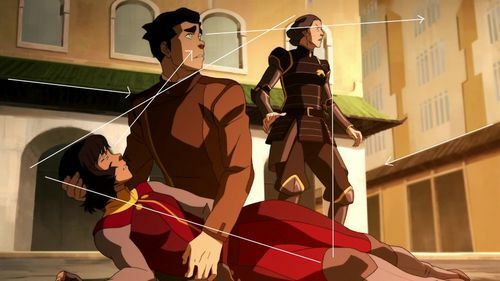 Baatar, Jr, tries to be of help…and really isn’t much help, but it’s a neat frame with almost all our heroes present (minus Lin who’s off grabbing Asami’s father). First, the group form a triangle, bringing balance to the frame. Second, everyone is generally grouped together by their overall identity: Team Avatar on the right, Varrick and Zhu Li in the center, Baatar and his mother, Suyin, to the left, and Tenzin and his children to the lower left. Most of these groups, likewise, are in line with the shadow and shapes of the two surviving Hummingbird Mechs behind (incidentally, with those who will end up piloting them closest to them, removing Mako from the picture). 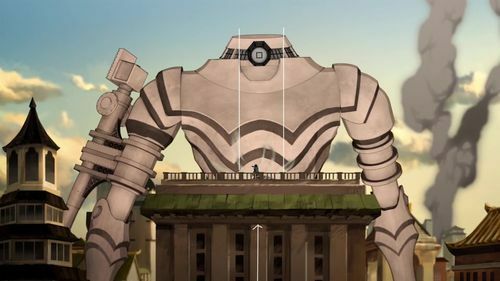 Another shot of Korra facing off against the Colossus, reinforcing the vast difference in size. All lines, including her line of sight, draw your gaze to Kuvira’s mega weapon. Interestingly, opposed to the earlier frame where the mech was surrounded by dozens of horizontal building lines, now there’s a number of vertical building lines. 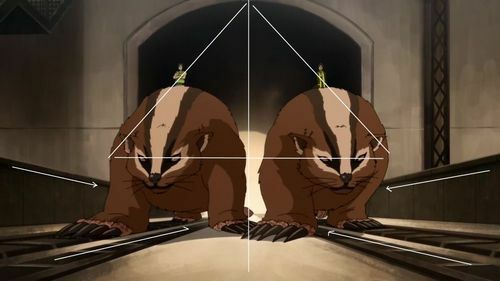 A nice show of symmetry as Prince Wu and Bolin’s cousin arrive on badger moles. The frame is balanced by the triangle that’s formed (or I suppose, an inverted square if you connect the dots downward) by the symmetry. In every beginner’s lesson on perspective, you get the road or railroad tracks drawing your eye to the horizon. Here we have them pulling us inward toward the original earth benders. This is a multi-tiered frame with three different planes. Baatar in the foreground, Korra in the mid ground and Asami and Hiroshi in the background. 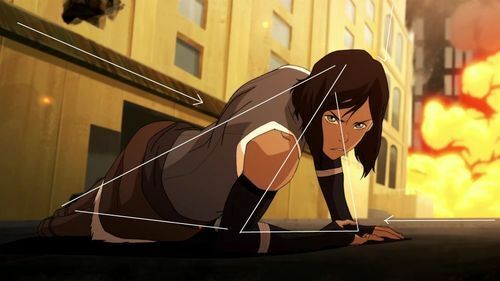 Despite the setup, Korra is the focus, hence the lines of the background that draw your attention to her. Korra preparing to counter attack in a fight to slow down Kuvira to provide time to finish the flying mechs. It’s a simple setup, but it draws your attention directly to Korra by use of the streets, as well the placement of the buildings. Even the intensity of fire, brightest closest to Korra, brings your gaze to her. Zhu-Li does the twirl about as Varrick prepares to propose to her. She’s perfectly framed by the steps and railing behind her. The fiancé to be is simply placed in the right spot. The end shot, naturally focused by the fact our heroes are inside a hole in the Colossus. 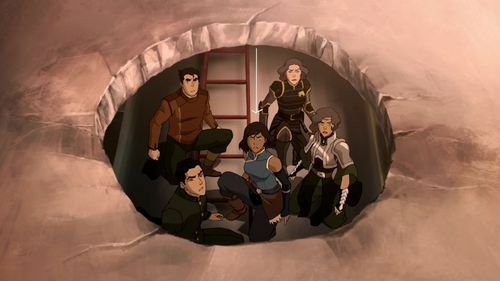 A ladder draws your gaze downward to Korra, who stands between the four other members of the party. 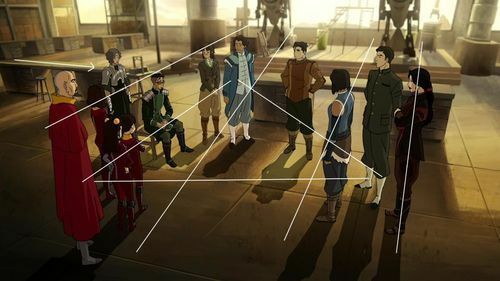 Interestingly, everyone is organized by family, the Beifong sisters on the right and Mako and Bolin on the left. January 28, 2015 in Uncategorized.